In the landscape or in the wild, white pines provide valuable winter cover for wildlife. Plus, a great many songbirds feed on the seeds and hunt for insects among the branches. 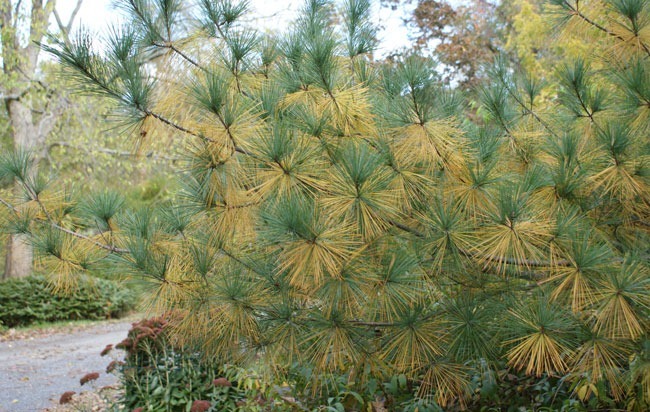 Species associated with white pines include nuthatches, jays, finches, yellow-bellied sapsuckers, pine warblers, and pine siskins. White pines also provide nest sites for eagles, owls, and other raptors. Turkeys also use them as roosting sites. I have to admit that every year I forget when it is that the needles drop, and this post will serve to remind me in years to come. Here, they begin to turn in about the first or second week of October, and drop by the end of the month. The dropped needles make a pretty pattern on the ground, too. I leave the ones that fall right where they are, except for those that land on the driveway, which I gather up and spread on the garden. Otherwise they go to waste on the driveway, and they make wonderful mulch for other growing things. I’ve been enjoying this beautiful display on my neighbor’s white pine all week. Thanks for sharing, Barbara. Nice post and useful info, Barbara. Thanks! P.A.M. Schaller: Barbara,your photos are as lovely as your watercolorflowers. I am going to send the next email to Fran. This week was my last Botanical Illustration Class. Thanks for your kindnesses.and our continuing garden education.